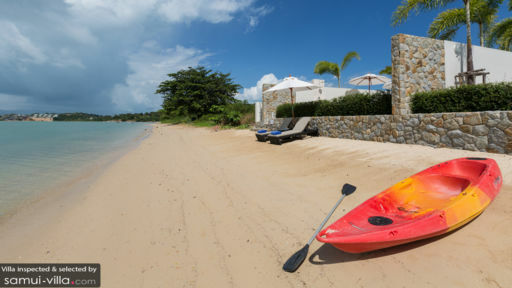 Villa Neung is one of four luxury villas part of Skye Beach Villas in Koh Samui along the coast of Plai Laem beach. Stunning properties sit along the white, sandy shores of the beach offering direct beach access to guests. Pristine white exteriors and interiors marked by the surrounding azure waters and blue skies make for a picture-perfect setting. 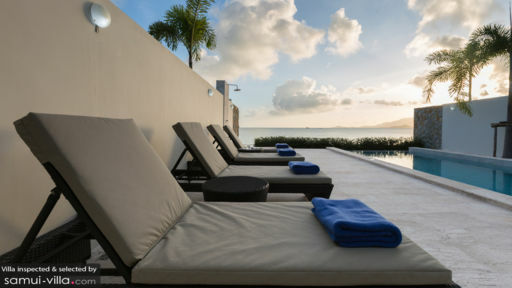 The ultimate tropical getaway with friends and family would mean renting out all four, interconnected villas for the best experience. 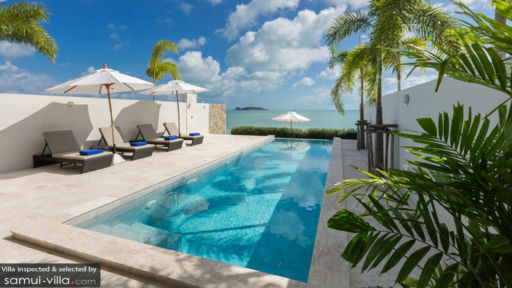 Villa Neung is home to two, ocean-facing bedrooms that are modern, contemporary, and opulent. There is so much ground to cover in and around Villa Neung that by the end of the day you will definitely wish to crash on your comfortable beds in the safety of your private bedrooms. The villa has two absolutely smashing bedrooms, both of which are ocean-facing with floor-to-ceiling glass walls and doors that slide open directly outdoors. Furnished with king-sized beds, the bedrooms are pristine white with pastel hues, linen bed runners drape the bed, and cotton bedding promise a good night’s rest. A haven and respite from the afternoon heat, these rooms are air-conditioned and the constant ocean view and tropical breeze will lift your spirits. Each bedroom comes with a well-equipped ensuite bathroom. Villa Neung, just like its neighbours, features a spectacular and lavish swimming pool with a slight infinity edge that extends out to meet the ocean. The entire outdoors is marked by resplendent blue skies dotted with fluffy clouds, distant isles rising over the horizon, and the endless dazzling ocean. The pool deck is lined with deck chairs as well as an alfresco dining area perfect for an early morning breakfast. Rinse off under the outdoor shower to start with your morning swim. In order to seamlessly blend indoor and outdoor living, Villa Neung Skye Beach has been designed with a glass-walled living and dining area. The elegant and classic décor can be seen even from outdoors owing to its floor-to-ceiling glass doors. The air-conditioned room is ideal for relaxed evenings where you can leave the doors open to the mesmerising, sun-streaked skies. The beauty of its indoors is reflected in the minimalist approach to design. Grey walls, plush egg-shell hued couches, and edgy décor creates a restful ambiance where guests can lie back and watch some movies, etc. on the flat-screen TV. The dining area is a six-seater with simple, white chairs and a circular wooden-top table that is your go-to spot for family meals. You can either prepare your own delectable meals in the fully-equipped, western kitchen or go ahead and request for a private chef to do the same for you. Another excellent feature at Villa Neung Skye Beach has to be its luxurious, functional, and opulent media room with a large projector screen, surround sound, and comfortable daybeds to lounge on. The discreet villa staff is there to make your stay all the more amazing with daily cleaning and maintenance services, security, and other additional services that are available upon request. The villa has a private chef trained in both local and international cuisines. Found right beside the azure ocean waters, Villa Neung Skye Beach is the just what the doctor ordered; a getaway amid fresh air with nothing but the vast ocean expanse to keep you company. There are many places you can visit on the off chance that you even leave the premises, and these include the popular Big Buddha and Bophut area where you even have the last of the remaining historical villages i.e. Fisherman’s Village.